Plague | AUTHOR. ACTOR. SWORDSMAN. “Humphreys’ expressive writing style and ability to weave a tale from these engaging characters’ respective points of view makes for a rich and addictive read, ideal for fans of historical fiction.” Publishers Weekly. London, 1665. The Plague is back. Thousands are dying, thousands more imprisoned in their own houses, red crosses painted on their doors announcing the pestilence within. While on a dark road outside London, a simple robbery goes horribly wrong – when the highwayman, Captain Coke, discovers that his intended victims have been brutally slaughtered. Suspected of the murders, Coke is forced into an uneasy alliance with the man who pursues him – the relentless thief-taker, Pitman. Clues lead them to the theatre and to the players who entertain Charles II and his libertine courtiers. There, two actresses – the spirited Sarah Chalker, the beautiful young Lucy Absolute – help to uncover a plot by a fanatical cult planning to kill King Charles and replace him with King Jesus. Love grows between the captain and Sarah – only for both murderer and plague to come between them. And as Death moves remorselessly through the glittering court and the fetid alleys, from the raucous playhouse to the barbarous prisons, can a highwayman, an actress and a thief-taker unite to stop him? An epic, suspense-filled journey through a great city’s nightmare, Plague has enough mystery, history and romance to entrance every historical fiction fan. “It’s vintage Humphreys, which is to say that it is beautifully written. I have long been a huge fan of his writing voice which is a perfect mixture of style, pin-point description, humour and a certain wry wisdom. His characters are larger than life but always credible. And so it was with Plague, which from the opening pages was a pacy, exciting read. It’s a brilliant depiction of seventeenth century London in all its glory and grime against the grim backdrop of the eponymous plague. A great read all round, and for my money Chris is better than Sansom and more than deserves equal success.” Simon Scarrow. Chris Humphreys has excelled himself in this richly glorious white-knuckle ride through a London torn apart by recent civil war and caught on the edge of plague. The language is lyrical and lovely and feels utterly grounded in the time. The plot is a perfect crime thriller with something new round each corner: always unexpected, always satisfying. The Thief and the Thief taker are both wounded, vulnerable, damaged men, but the synergy of the two together is a glory to watch and I loved it. This matches the earthy lyricism of Pepys with the crime-crafting talents of a Rankin or a Cornwell in a vibrant, utterly immersive wonder of a novel. Impossible to put down. Read it.” Manda Scott. 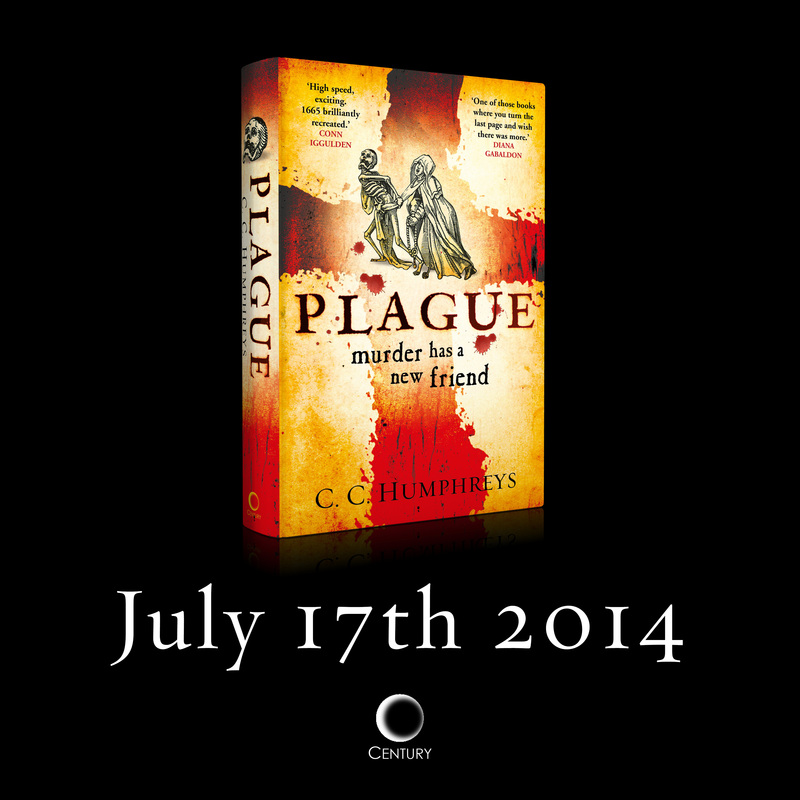 When will PLAGUE be available in the U.S. and on e-readers ?? Don’t know yet. Soon I hope! Thanks for getting back to me ….and I agree… soon I hope ! Hi -Just finished reading “Plague” and will post my review on the Pepys Diary site. Loved the story, but have to admit that as a detailed historical (biographical) reader of the time, I had to take the characters within the Court of Charles II with a ‘fun-loving’ grain of salt. If you ever re-publish, on page 38, Charles II’s wife “Henrietta Marie” is mentioned. Henrietta was Charles II’s mother. Catherine of Braganza was his wife. Having read every biography of Queen Catherine I could get my hands on, this was a blaring mishaps to me and it took me awhile to pick up the book again and read from there (but glad I did). Overall loved Coke, Dickon and the PItman crew.The adventure was wonderful and kept my interest! Chris-it was a great read and I think you’ll be happy with the review! Hello, Mr.Humphreys! I’ve just read «Plague».The book is really great and exciting! So much to learn about this period in the history of England! Reading the description of the way people lived then I couldn’t help wondering how they managed to survive. I mean not nobles of course. I liked the characters very much, especially William. And I felt terribly sorry for John Chalker and Quentin Absolute.I literally couldn’t make myself read the lines about John’s tortures. He really appealed to me from the very beginning. Guess his murderer’s death was too easy. This is really great that nearly in every book there are Absolutes. I like this idea very much. P.S. Will there be a continuation? In some way the end hinted on it. Elena! We’ve spoken before haven’t we? Where are you based ? So pleased you liked it. Sorry about John. Hate torturing my brother actors! I am trying to link up all the Absolutes. Have you read Shakespeare’s Rebel yet? And yes, I am working on the sequel Fire right now. All best! Thank you for the answer! I’m really glad there will be a sequel! Look forward to reading it. Yes, I’ve read Shakespeare’s Rebel and like it very much as well. I guess I even felt pity for the Earl of Essex. It seems strange that sometimes those in power execute people close to them to feel regret afterwards (just like Robespierre and Camille Desmoulins). Maybe Elisabeth had little choice but still she could send him somewhere instead of executing. Yes, I’ve written to you several times, I’m your big fan. Actually I like all of your historical novels. I’m from Russia. You must be a history and English scholar. Your knowledge of both is so great. Where are you in Russia again? Student? I study in Moscow, second year of Master’s programme in Linguistics. History is just my passion. Thank you so much. I hope one day you will come to visit Russia! I’ve just finished ‘Fire’ (in two sittings!) not realising that there was a prequel to it… I’m looking forward to ‘meeting’ Coke Pitman and Sarah again, just a shame I know how their story ends..
Wow! Love to get comments like this. Thanks so much, Mandy. Glad my stories have had an effect. For the record, I miss the Rombaud gang too!